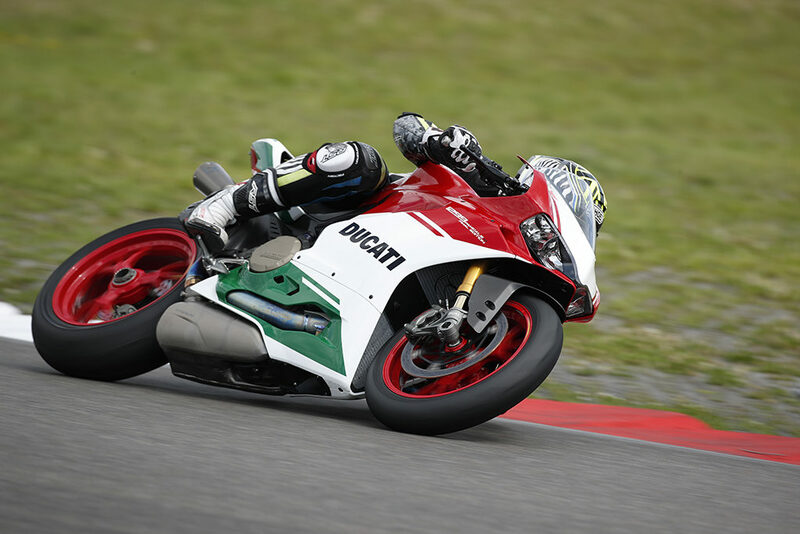 Just like Christmas and lap dances, all good things have to come to an end, and that includes Ducati’s iconic reign of v-twin superbikes. 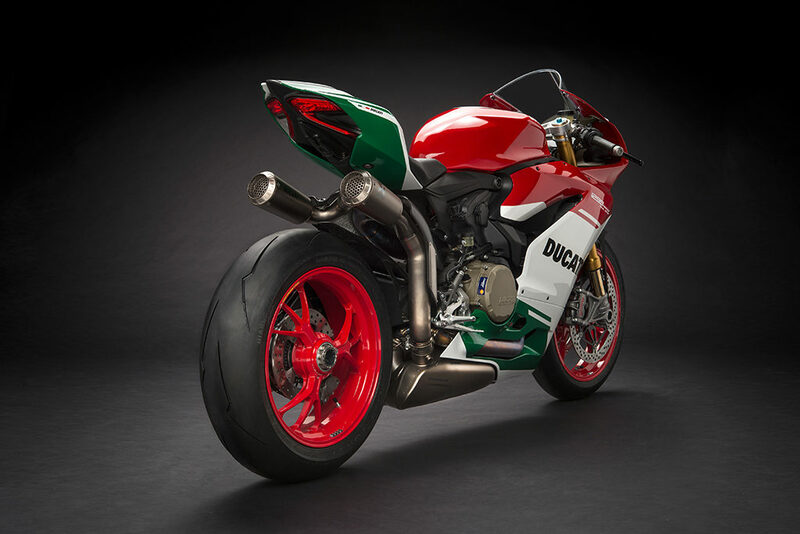 For twenty nine years, and a few handfuls of days, the Italian powerhouse has ruled supreme in the twin pot department, producing a plethora of pornographic (looking and sounding) motorcycles that will forever leave an impression on sportsbike fans the world over. And while it’s hard to conceive this really is the end of an era for the Bologna built bullets, Ducati has rightfully and honourably chosen to send off its v-twin heritage in the most fitting and worthy way by going balls out to produce an extra lightweight, ridiculously powerful and stunningly beautiful street bike. 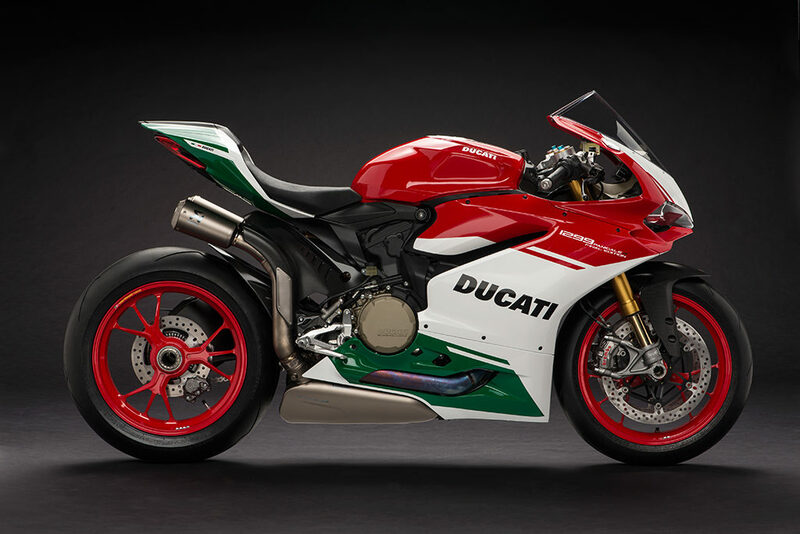 Aptly, they’ve called it the 1299 Panigale R Final Edition (FE), and it’s officially the joint most powerful production v-twin to grace this wonderful world (sharing that prestigious accolade with its spanking 1299 Superleggera sibling). But the good news is it costs around half the price of latter mentioned Ducati, with a retail price confirmed at £34,995. 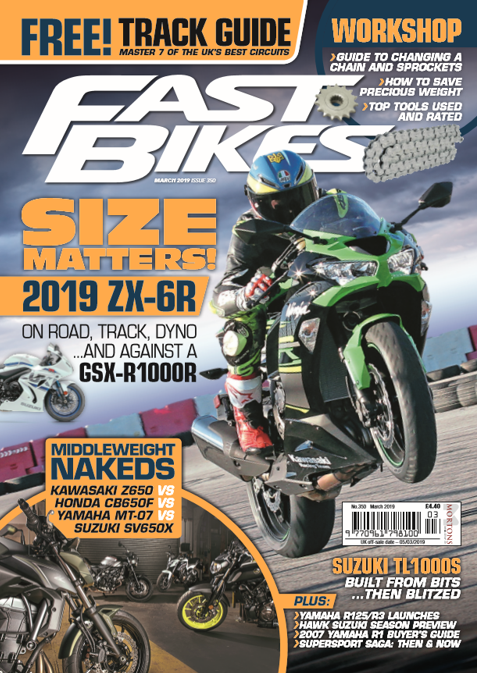 If you’re like me, and by that I mean tight, then you’re probably doing the maths and calculating how many other production sportsbikes you could get for that kind of money, but rest assured that this is one of those instances of quality over quantity. See, every last inch of the FE has been careful honed, selected and constructed with both beauty and performance in mind. This isn’t just the most powerful sportsbike on the market, but also one of the very lightest, with a kerb weight of just 190kg. And it’s also one of the most sophisticated, as its crammed with an abundance of technological brilliance that includes GPS, lean angle monitoring, a race-spec traction control package and more rider customisation than you can shake a stick at. The list goes on and on in a manner that reassures the investment you’d be making should you decide to rob a bank and hand over some of those hard earned spondoolies. The performance theme’s continued in the handling department where the 1199R’s die-cast frame is mated (sorry for being so graphic) with Öhlin’s latest and greatest race quality suspension (NIX forks with a TTX36 shock), which are both laden with adjustability. 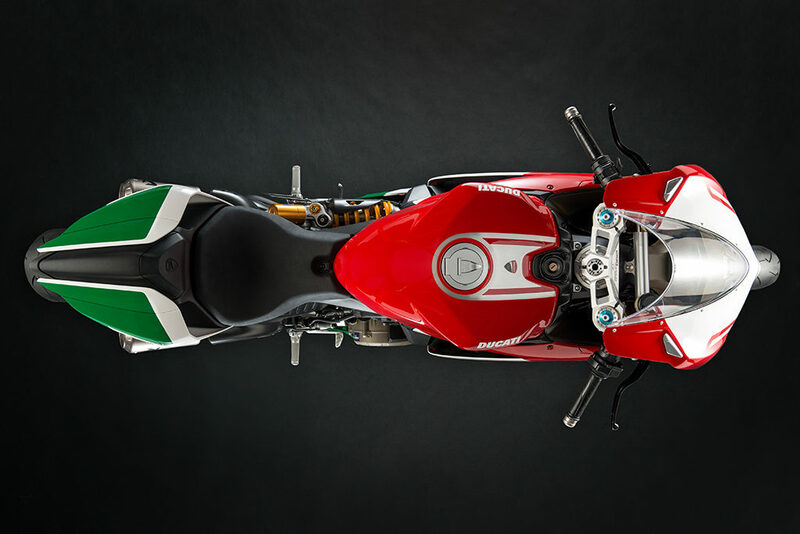 Interestingly, the suspension units are completely mechanical, as opposed to the Panigale S’s electronically alterable options, but that’s undoubtedly a nod to the pursuit of the ultimate lap time, and lightest of builds (as electronic gizmos do add weight). Hidden within the focused moncoque frame lays the model’s potent 1285cc motor, which makes 206bhp and packs enough torque to rip your arms off – if they’re not glued on properly. Thankfully, mine remained in their sockets during my test ride of the Final Edition at a sun blessed Nurburgring track launch. On arrival, it was love at first sight from an aesthetics point of view, and the relationship blossomed intensely when the monstrous v-twin was fired into life; launching heavenly notes from the full titanium World Superbike-style Akrapovic exhaust system. 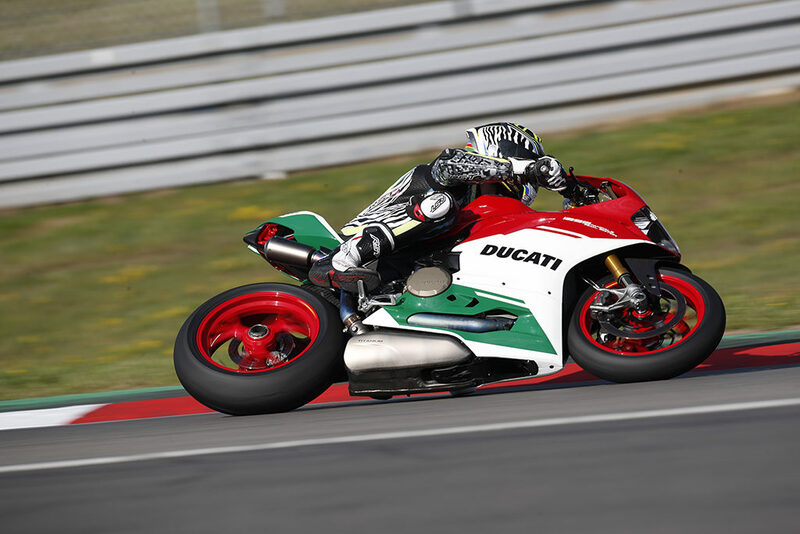 If you’re a Ducati owner, fan or even a hater, then you’ll undoubtedly be familiar with that rumbling boom that big twins create, which in the case of the FE has been taken to a heightened level. I was having fun just revving the bike to warm it, but the real enjoyment got underway when I cocked a leg and headed off down pitlane. It was one of those times when excitement and nerves blend to leave you curious, a bit like when fifteen women descend on you for a one-nighter and you’re unsure of how you’ll cope – you know the ones? But any pre-ride jitters were soon quashed as our group was released and I found myself up at the pointy end on a track I’d never seen outside of a computer game. The course proved a good mix of technical and speedy section, with the latter zones allowing me to sample the enormity of the Ducati’s motor. It was, well… not really that scary to be honest. 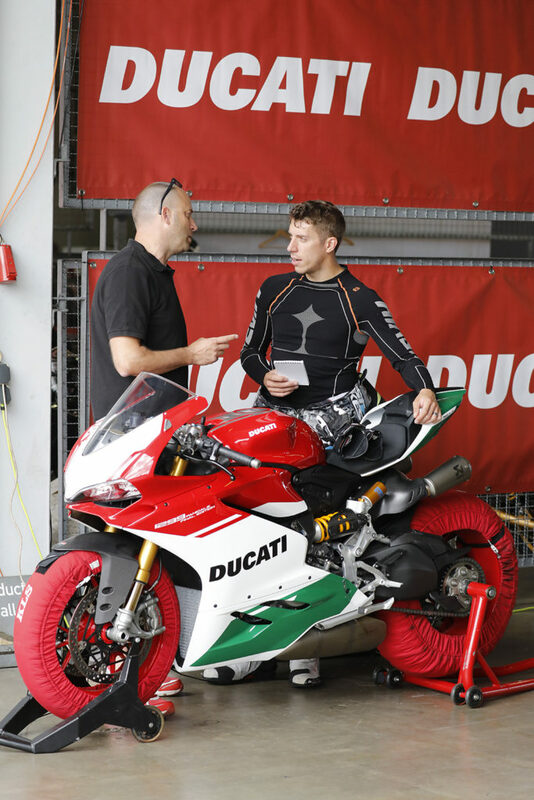 I had visions of the motor being a right handful, leaving me wincing under my helmet, but the sophisticated tech on the Ducati meant that the bike’s motor was simply very useable. Much more useable than the 1299 Panigale S, as it happens, which months earlier had tried to ping me off over the course of two days on our SBOTY test. Yep, I was pleasantly surprised by the motor’s character, but also by its pace. 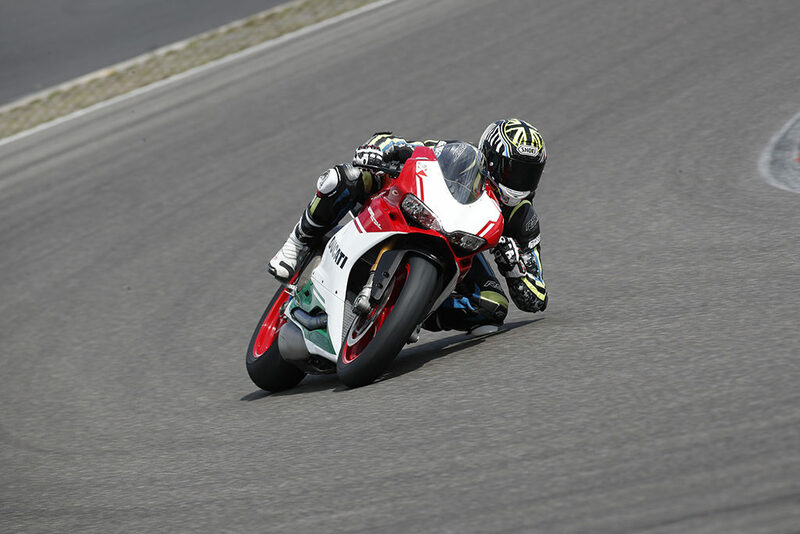 Before long I found myself scrapping with an RSV4-armed German who was slightly better in the corners, but struggling to stay close down the straights. If ever you needed a good barometer of the Duc’s motor, that was it. The FE would just zoom past at a fair rate of knots, and the awesome Brembo M50s made light work of stopping my derriere come the end of the straights. They are simply the most amazing calipers on the production bike market, offering great feel, loads of stopping force and blingy looks. And these particular items also boast the advantage of cornering ABS, which meant I could trail away deep into corners without ever risking an embarrassing get off. 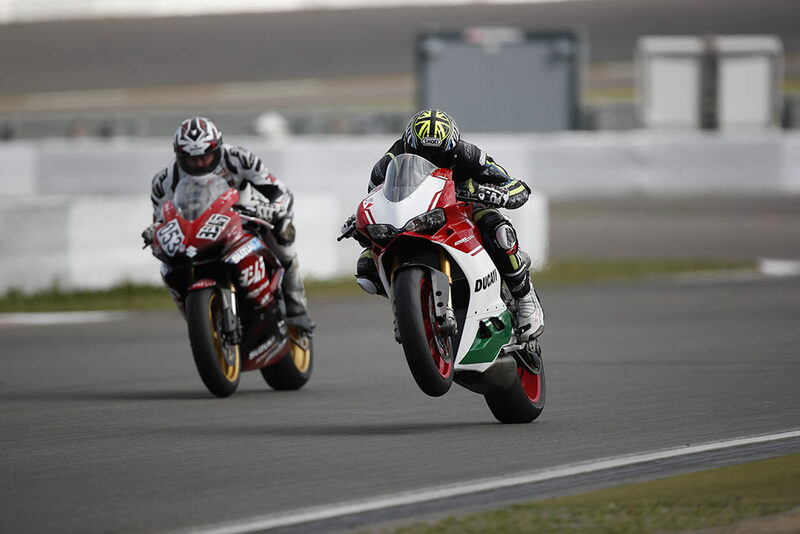 As the Ducati guy said to me before I got on the bike, ‘I’m not going to tell you not to crash, but have fun, because when you’re having fun it means you’re not crashing’. And with that directive embedded in my mind, I was truly out to make the most of this unprecedented motorcycle. Despite its many new features and qualities, the Ducati didn’t feel totally alien, especially in the handling department where its characterful weave felt all too familiar to other Panigales I’ve ridden through the years. They’ve all seemed to have this wayward motion that’s not dangerous but, just like an aged dad on the dance floor making all the wrong shapes, it is a tad off-putting. It’s weird because the bike felt perfectly planted once in a bend, and it wasn’t particularly unstable on the entry to corners, but it got a bit frisky when the gas got cranked on the way out; this weave would kick off and it was a case of having to navigate my way through it by either sheer brute force or a sympathetic throttle. A switch of gear was also a good way to calm down the situation, but I found the Ducati quite disliked shortshifting. Don’t get me wrong, with a bike that packs 142Nm of torque, it could never be lacking in oomph, but there was a definite lull in the delivery if I found myself even one gear taller than where I ought/needed to be. But back to the topic in question; stability. No matter what tweaks I made to the setup, including raising the rear of the bike to put more weight over the nose, nothing got rid of the shakes. And tweaking the steering damper by a few clicks didn’t prove a fix all, either. 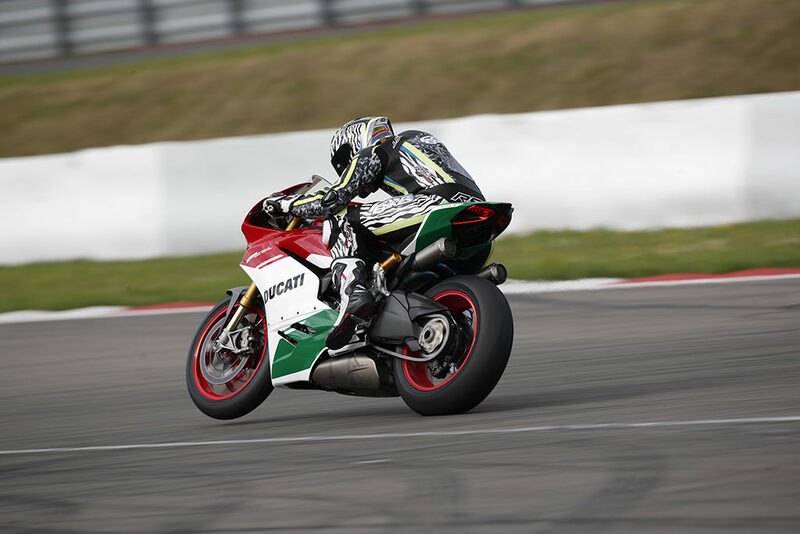 I got chatting to the Ducati guys about it and they said the first lot of journos had complained of the same behaviour at Hockenheim a few days earlier, which was reassured me I wasn’t going mental. It feels wrong to criticise a bike this beautiful, and costing the same price as three houses down my street, but this was, for me, its biggest foible. That and the height of the standard pegs that saw my feet gracing the ground at speeds utterly unholy; a totally unsettling experience, that would in turn cause me to twitch, which in turn would set the bike off twitching. Yep, the Ducati didn’t like getting upset, so it payed to be über smooth where possible. But, to counter that, the real fun only came when things started getting leery. 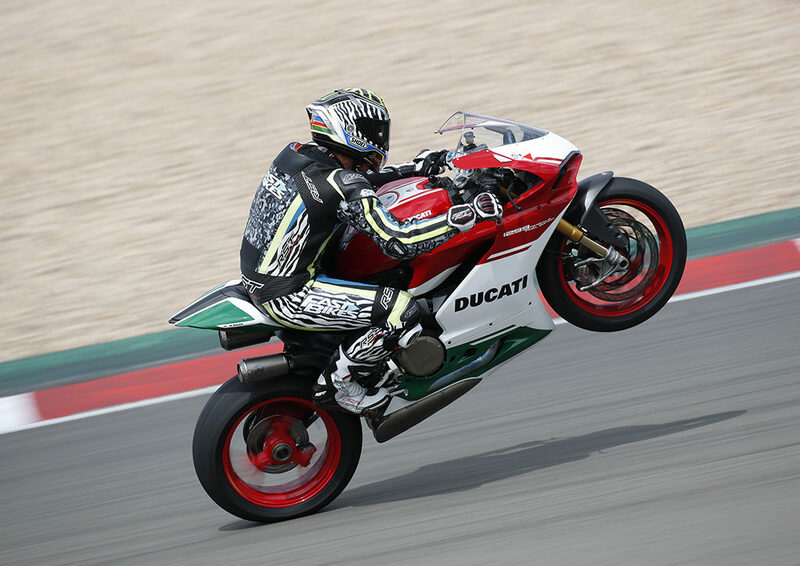 When I first went out on track I had the traction control (DTC) set at level two and the anti-wheelie (DWC) was on. 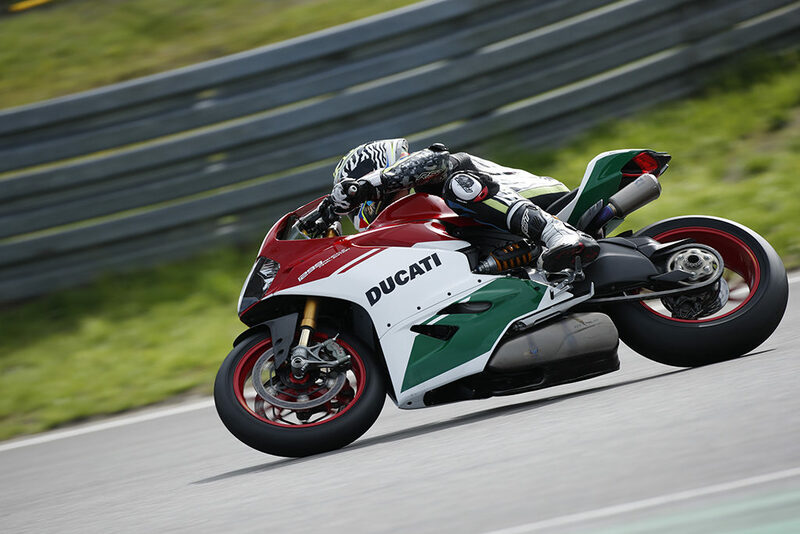 Consequently, the Ducati’s 209bhp motor felt a relatively tame and obliging lump. But by riding it with those technological constraints removed, the raw ‘kick-your-head-in’ nature of the Duc was set free. And it was bloody marvellous to sample. I found myself having to relearn corners as wheelies were assured at every exit, and so too were rear wheel drifts. To be fair, the downside of these actions was the bike would become unsettled and nab me of my pace in the process, but it was worth it for the shits and gigs. I’ve always found Ducati’s to be informative creatures – you know where you are with them at all times – and the Final Edition is no exception. The wobbles might have let the ride get a tad uncontrolled at times, but it was near impossible not to trust in the trick Öhlins suspension that graced both ends of the FE. They were so telling and obliging, which gave me the confidence to do nobby things like hang off in the style of a chump and put my elbow down. Other profound handling qualities of the Ducati included the ability to hold a firm line, both through fast and slow corners, and to switch direction with minuscule effort. Because the FE appears a sizeable motorcycle, it’s easy to overlook the fact this über powerful machine weighs just 190kg and hosts an especially low unspurng weight thanks to components such as its forged aluminium wheels. The realities of which meant the bike would ping from one side to t’other faster than my brain could calculate… which isn’t hard to be fair. Right at the end of the lap was an uphill chicane that was hit in second gear. It’s a very fast approach, and because the chicane’s relatively straight, it means you carry a lot of speed through the left and into the right. It’s also an extremely narrow part of the track so it should’ve proved a damn sight harder to go from knee down left to knee down right, but the Ducati absolutely smashed this little obstacle course like an absolute weapon. I can’t think of another litre bike, or bigger, as capable at transitions as the FE, which proved even better than the lithe handling Panigale 1299 S.
Despite sharing the same numerical reference in their names, there are huge differences between the two models, with the one of the salient points being the FE features the 1199R’s die cast frame, as opposed to the weightier 1299 Panigale jobby. The weight’s also less and the powers up by some 12bhp, boosted by a whole wealth of clever engineering features and components. But despite all my riding highlights, of which there were many during my three twenty minutes sessions on track, and all the oohing and arghing I did whilst gawping at the FE in the pit garage, it was impossible to not question whether I could justify the significant price hike from the highest spec 1299 Panigale S (£21,995) to the £34,995 price tag attached to Ducati’s swan song v-twin superbike. Yes, I did find the FE a much more enjoyable bike to ride, and it was clear to see and feel the difference between the two models, not to mention the added attention the special model received from every man and his dog/wife who appeared to make a special journey to my garage to goggle – unless they’d actually come to look at me? But those realities aside, was it really worth the extra whack of cash? I’d say not. Or at least not if your focus is purely on performance alone, because the gains simply weren’t overwhelming enough. But I don’t think that’s why people will buy this bike, especially with the knowledge there’s a V4 production Ducati on the horizon which is likely to outperform the entire 1299 familia. 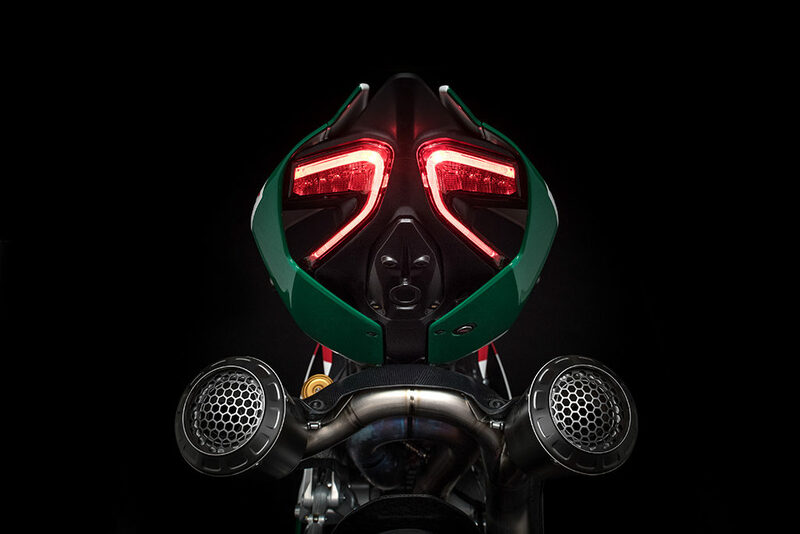 They’ll buy this bike with nostalgia at heart, because it will forever be a very special motorcycle; a real head turner that is worthily signing off perhaps the most iconic family of motorcycles to ever make the production line.